So here we are at month number six, half a year...wow. Six months of photo shoots, six months of stickers, and six months of a whole lot of fun with sweet little Avery here. As you can see from the pics, our photo shoots get more and more fun each month as her personality just keeps growing and her smiles are now paired with laughs and babbles. Long gone are the days of her tipping over in the chair like in month one, this was this first month that Avery was able to sit all by herself in the chair, which she seemed pretty darn happy about. "Ha ha! I'm 6 months old!" Here are her monthly stats, weight: 20 lbs (around 95 percentile) and height: 30 inches (above 100 percentile). As I've said before the girl loves to eat, and I continue to feed her on demand...when I'm home that is. And it seems like her Dad's height might be coming into play here as well! As with every month, there are usually some highlights of the photo shoot. This month, we had several. The first is that she loved playing with her toes. Since she was "Miss All Grown Up" and sitting up during the pics, her feet were what she often grabbed to keep herself entertained (and balanced). Love those toes! Showing off her "sitting up skills". Teething: Last month I mentioned that she was cutting two teeth and although it was a struggle to get a pic then, it was much easier this month, which you can see below. I'd love to post more about some alternative teething remedies we've been using other than her amber teething necklace, but until I find time to do that in my schedule, I've got to tell you that my must-have item is Hyland's Homeopathic Teething Tablets...couldn't live without these things! "See my little pearly whites?" Daddy's Birthday: Also this month we celebrated Brandon's 32nd birthday, his first with Avery here, so that was a lot of fun. Here are some photos of the birthday celebration. We got the party started the weekend before his birthday at his parents house, with the usual cake, candles, and presents. "Hey guys, it's my dad's birthday!" "No smiles for you mom...it's not your birthday." Brandon's "green" birthday wrapping and decor. Oh yeah, it doesn't hurt to have this little cutie help me celebrate as well! For one of my presents to him, I made this picture-collage from an idea I found on Pinterest (oh Pinterest how I love you!). After seeing the idea online, all I did was pick up some big letters from a local craft store, took Avery's pictures holding..and eating them, and then had them printed and I put them into this frame. I was really happy with how it turned out and Brandon loved it too! I thought it would be fun to re-take this picture again each year and see how she changes. Brandon's b-day present from Avery and I. From this fun little "daddy" photo shoot, I got a cute outtake picture that I just have to share. It's one of my new favorites of her. Something about that smile and those cheeks. Baby-Led Solids: While we're on the topic of food, I've started giving Avery some solid food of her own with a method called Baby-Led Weaning or "Baby-Led Solids" a name I feel describes it more appropriately. I plan on posting about this more in the future (can you tell I have a lot of blog topics on my mind and no time to write them in! ), but for now, let give you a quick description from a baby-led weaning (or BLW) website:..."Baby-led weaning is a somewhat cheesy term for just letting your infant self-feed. You cut food up into manageable sticks and offer it, they eat. It’s really pretty simple." Although the word "weaning" may make you think I'm stopping breastfeeding, I'm not. I continue to nurse her just as often as I always would, just now I offer her some form of solid food at least once or twice a day while I'm eating my meals. Towards the end of month 5, Avery really started showing an interest in the food I was eating and would crawl towards it, reach towards it, and even try to grab it from me. This along with many other signs that baby-led solids talks about, lead me to believe she was ready to try some solid food. Now you may be asking, where are the jars of baby food? Where's the purees or mashed veggies? Well, a unique aspect of baby-led solids is that there is no "baby food". You start out by giving babies, real food from day one, such as a stick of apple, slices of a banana, a stalk of broccoli, etc. And you don't chop it into ten million little pieces. The key is to actually give them the larger chunks of food so they can get practice with their fine motor skills of holding the food and bringing it to their mouth, a task that is difficult to do with finely chopped food. As of now, she only eats organic fruits and vegetables, some cooked, some raw. I'm sure in the next couple of months I will continue adding some new foods to her "plate", but one thing that won't be on there for awhile will be gluten of any form. With my history of food sensitivities, especially to gluten, I feel it's best to wait until Avery is at least one or two before I even try letting her have any form of gluten. For now, it's super easy to avoid it since I'm gluten-free too and all the meals I cook are obviously gluten-free. Other things that will NEVER be on her plate are animal products of any kind...milk, yogurt, cheese, eggs, meat, you name it...this vegan baby won't be touching or eating it. 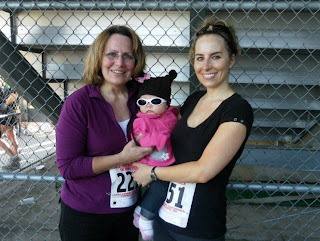 5K Race: Another fun thing we did this month was to do a 5K road race...which we walked. Now this is not just any old race, this is a race my mom and I have done for 3 years in a row now, and so it was only fitting that we do it again this year with Avery. So we broke out the stroller and headed off to the race. "I'm ready to race guys!" Our racing crew...with one extra this year! Cross Country Meet Fun: Adding on to the outdoor time we had during the race, we also went to a few of my dad's cross country meets. He coaches a local high school cross country team, and when his meets were close by, we made sure to stop by. Avery loved being outside, seeing all the different color jerseys of the runners, and most importantly, seeing her grandpa! "Just give me a purse to play with and I'll be good." "Hey grandpa! I think I like cross country!" Growing, Growing, Gone: Well, after 6 months, we've finally done it. We've filled an entire storage tub full of all the clothes Avery has outgrown. I bought the container around 4 months when the "too small clothes" started bursting out of drawers and it took me about 2 more months to fill it up, but now...it is officially full! Before sending it on down to storage in my basement, we took a few last "farewell" pictures. All I can say is, boy do babies grow fast! "Oh yeah, I'm a big girl now!" "Uh wait mom, I like this one!" Crawling: As I mentioned last month and showed in a play-by-play of pictures, her crawling skills were starting to show, even though it was more like she was doing "the worm." This month she has gotten stronger and more purposeful in her movements, although she still takes on a "worm-like" motion of throwing her chest forward when starting out. The biggest change this month is that it is hard to keep her in one area. Usually I'll put a rug down and be like, "Oh okay, you can crawl, but let's stay here on the quilt." Ha...yeah right! This month she is everywhere but the quilt. Crawling towards the couch, the entertainment center, vents on the floor, and her favorite: the fireplace. I have a feeling I will be posting about "baby-proofing" our home in next month's post. For now, here's some pics of our little crawler. like the cable box and DVD player. And vents...and cords...time to baby-proof this green house! One of her many facial expressions. "Bam! I'm in a pumpkin!"